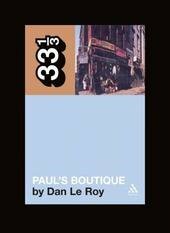 The fourth and final book we'll be publishing this spring (it could have been more, but some authors are running a little late...) is Dan LeRoy's wonderfully comprehensive history of the Beastie Boys during their Paul's Boutique era. (Apologies for the cover image not being up yet on Amazon.com - it's not like we haven't sent it to them a zillion times.) It features interviews with a huge range of people, and three very fetching and rare Ricky Powell photos at the front of the book, too. Oh, and check out the book's Myspace page, if you like. Perhaps the best gauge of the difference between Licensed to Ill and Paul's Boutique is provided by the first half of this track. In the infamous video that accompanied "Fight for Your Right (To Party)," the Beasties pushed around bespectacled nerds. On "The Sounds of Science," they have become - for a few lines, at least - those nerds instead. "In high school, we all had to wear science-class glasses and work with the Bunsen burners, so it's kinda like second nature to us," Mike D would explain. "Somebody like N.W.A. might be talkin' about 'science,' but they never bust out in science-class glasses." In typical Beastie fashion, something serious was lurking beneath that nonsense. Discounting the novelty rap records that proliferated in the eighties, hip-hop had never been this deliberately square. Yet with its British music-hall bounce and lyrics that name-checked Galileo, Sir Isaac Newton and Benjamin Franklin, the initial half of "The Sounds of Science" was a groundbreaking moment, one that lived up to the boast that the Beasties were expanding the genre's boundaries. It offered proof that there was room for geeks - albeit lyrically acute ones - in hip-hip's big tent, and opened the gates for a flood of defiantly nerdy rappers who would pour into the underground a decade later. The song also momentarily drops the gangsta facade the Beasties had toyed with since their inception, and reveals them all in their middle-class whiteness - a rather brave thing to do for a group hoping to maintain its hard-won street cred and its place in a predominantly black style. It hadn't started out that way. When the Beasties had given Matt Dike and the Dust Brothers carte blanche to sample anything their hearts desired, Dike first indulged by lifting Ringo Starr's drums from the reprise of "Sgt. Pepper's Lonely Hearts Club Band," and coupled them with the two-chord guitar riff of "The End," scratched in by Mike Simpson. This pair of Beatles samples made for a straightforwardly catchy backing track, one that Simpson was sure had hit potential. "If you didn't get all the other wacky stuff we were doing," he says, "you might get this one." Lyrically, "The Sounds of Science" is perhaps the most far ranging of any song on Paul's Boutique, beginning high-mindedly in the lab before MCA, out of the blue, compares himself to the crucified Christ. This would one day become standard practice for the MC persecuted by "haters" or the police, who often affronted the hip-hop community by arresting its stars for actual crimes. Yauch's reference, however, suggests the aftereffects of the media scrutiny the Beasties had endured during the Licensed to Ill era. Even more likely, it was simply an attempt to rile folks up, a habit Yauch and his bandmates had not yet abandoned. In the same vein are the verses that begin the second section of the song, as puerile a description of a sexual encounter as any mentioned on the first album. And Ad-Rock throws another curve by alleging police were behind the crack epidemic then raging in urban communities. Reinforced in "Car Thief," where the Beasties brag about scoring weed from the local cop, this theory was coming to the fore in hip-hop, most prominently in Boogie Down Productions' 1988 song "Illegal Business." "The Sounds of Science" would later lend its name to the Beasties' anthology (which did not, however, include the title song). Part of the band's live set for a few years, the tune has been on mothballs since the second Tibetan Freedom Concert in 1997. * The barnyard noises on the track have been commonly assumed to be a cow-(or sheep)-in-a-can - a toy that approximates the sound of a farm animal when turned upside down. Not so, according to Mike Simpson. "I don't wanna say where it's from, but it's basically a famous person's voice, that I tweaked in such a way that you would never know what the original source is. But it does sound exactly like a cow-in-a-can." This book is fantastic. Actually It's been quite a week, Stone Roses came, read that (again, fantastic) and on the day I finished it Paul's Boutique came. Finished that last night, and Doolittle arrived this morning. Sweet! i just wish they were longer, and new ones came out every week. Just finished the "There's a Riot goin' on" one, can't wait for this one. The new Beastie Boys book is fantastic. I finished reading it and altough I am a huge fan - I still learnt a lot of interesting facts. Definately worth checking out!